Chinese policymakers are at a crossroads as the word around them crumbles and surging debt levels create unique risks for the economy. At the heart of the latest round of export-driven weakness is worsening international trade thanks to persistent commodity deflation and an ongoing currency devaluation war amongst major economies. One of clearest tools for policymakers to reverse the recent decline in lieu of adjusting interest rates and bank reserve ratio requirements to sustain another lending boom is intervening directly in the Yuan. Since the middle of 2015, the People’s Bank of China has been aggressively lowering the Yuan in relation to the dollar, especially amid the strength in the US currency in the lead up to recent policy normalization efforts. 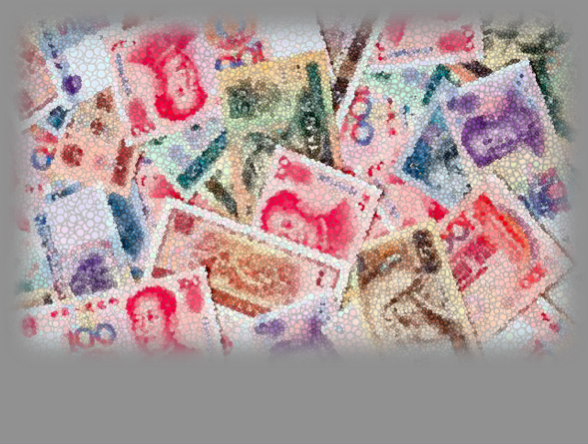 However efforts remain incomplete and 2016 will be a year of additional unilateral moves to devalue the Yuan. For China’s Central Planners, the major problem of the goal sought economy is its interaction with other advanced and emerging market partners. Hiccups both domestically and abroad have seen the export economy shrink drastically over 2015, with total exports for the year tumbling by -2.80%. Imports did not fare favorably over the period either, slumping by -14.10% in 2015 and contributing to widespread damage to emerging markets and key commodity exporters. In general this is the strongest reflection yet of slipping global trade fundamentals, trends that are likely to persist over the next 6-12 months. Despite unleashing a tidal wave of stimulus, growth in China decelerated to the slowest pace of expansion in 25 years, not a strong showing for the world’s second largest economy. Liquidity injections and market interventions have become regular fixtures of China’s stretched financial system, with each subsequent action experiencing diminishing marginal returns and deteriorating confidence amongst market participants. At this point, the easiest mechanism for policymakers to pursue without disrupting liquidity conditions is further Yuan devaluation. It is by far the easiest lever to pull at a time when other actions may have unforeseen consequences. Increased competitiveness in the export economy is essential to sustained expansion, especially after the latest shot in currency war from Japan taking rates into negative territory. However, the degree to which China can devalue the Yuan has a limit, and going too far too quickly could accelerate the existing pace of capital flight which is already at uncomfortable levels. Famous for his activities betting against the Pound in 1992 in which the famed speculator made nearly $1 billion after “breaking the Bank of England,” investor George Soros is back in the game, but this time with a focus on Asian currencies. Although not mentioning the Yuan by name when discussing his negative outlook of the Chinese economy and speculating a hard-landing scenario coming to fruition, Soros’ comments were enough to draw the ire of policymakers who responded sharply. China’s People’s Daily poignantly carried a piece entitled, “ Declaring war on China’s currency? Ha ha. ” The line comes of empty and laughable at best, because from an outsider’s perspective, the emperor is wearing no clothes. For all its tough talk, the broad market-based reforms China is attempting to implement are simply not compatible with a centrally planned economy. Every successive policy adjustment has been in response to worsening conditions, and in many ways only a temporary fix. Now that the devaluation is underway, precious capital is fleeing the country, in many ways a more important figure than steadily depleting foreign currency reserves. The exodus of money from China exceeded all expectations, with an estimated $676 billion in outflows recorded during 2015 according to the Institute of International Finance. This number could easily accelerate in 2016, especially for Yuan holders eager to front-run the Central Bank amid expectations of another 10.00-15.00% devaluation in 2016 to prop up the export economy. After falling by -4.95% against the US dollar in the last 52-weeks, the offshore Chinese Yuan looks set to experience another dramatic devaluation in 2016, however, this does pose some risks for investors looking to ride the currency down. First of all, China is aware of other the widespread speculation against the Yuan, meaning that it might seek to punish Yuan shorts through unilateral moves to revalue the currency. 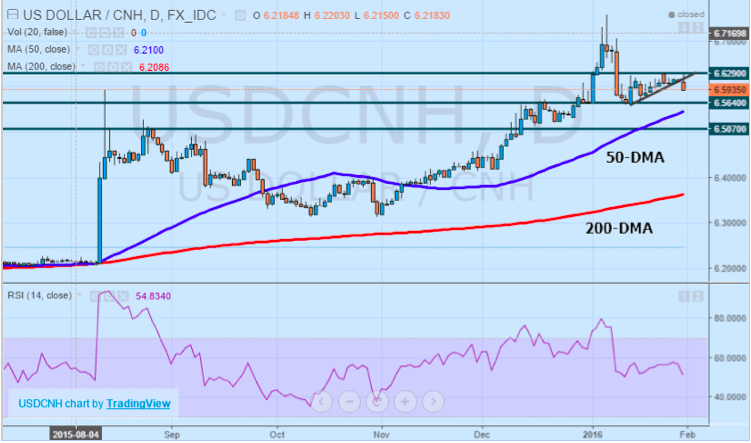 While technically the USDCNH pair has been trending higher since bottoming out in early 2014, the pace of gains has gone nearly parabolic in the last 6-months, increasing the risk factor of taking long positions in the pair betting on additional devaluation. Divining the timing from technical analysis might help to define entry points, but it is an imperative to set stop-losses because this is not a free floating pair. After a recent failed breakout attempt in an ascending triangle technical pattern, USDCNH has once again reversed lower, with momentum towards the 50-day moving average which is currently acting as support. Both the 50 and 200-day moving averages are trending higher, adding to the bullish bias in the pair. However, ideally, long positions should wait for the combination of the 50-day moving average and support at 6.5640. 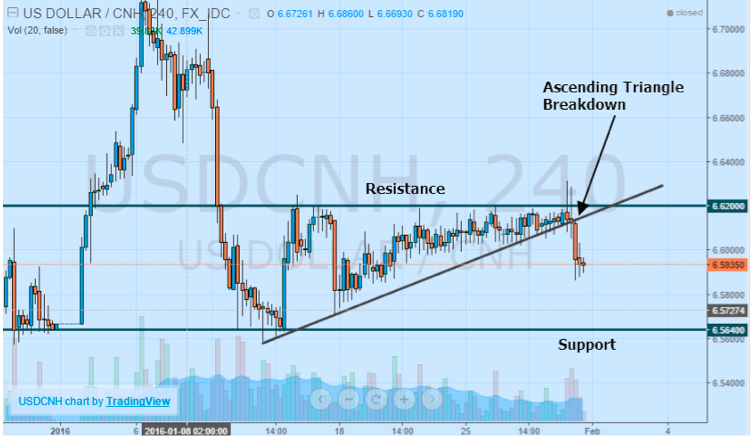 This key support level has been tested multiple times, but any break could open up further ground for losses in the USDCNH towards 6.5070 before any sustained rebound occurs. Resistance sits firmly at 6.6200 with any move above this level paving the way for a run back at multi-year highs of 6.7585 seen earlier in the year. While China may be taking care to warn off speculators with a concerted effort intended to jawbone against shorting the Yuan, policymakers are left with few other choices when it comes to hitting the nation’s ambitious self-imposed growth targets. Further adjustments to interest rates and bank reserves come at the risk of expanding the debt bubble additionally and diminishing marginal returns. Yuan devaluation ensures the economy can withstand the trade contraction while offsetting the impact of the stronger US dollar. The risk of a depreciating Yuan is sustained capital flight, but nevertheless, a threat policymakers are willing to bear considering the potential tradeoffs of other actions. In spite of repeated warnings, the Yuan only has one clear direction over time, downwards.